The next 20 minutes were crucial. The social mobilizer of Caritas Pakistan Multan CPM immediately called Rescue 1122 but they were in another village a few kilometers from Chak (village) No. 5 where the team was stationed. The team next called Samuel Clement Executive Secretary CPM who approved taking matters in the hand and doing all that could be done to save the villagers. Zia,28, took out the emergency response kit received in Community Based Disaster Risk Management Training but the only problem was, he did not know how to swim. “I wore the life jacket, grabbed a lifebuoy and started wading in the lake towards the mud house located about half a kilometer from the road. The only fear was of ditches, commonly found in farmlands, but I trusted the equipment I had”, he recounted. Inside the house awaited Yaqoob and Ayub Masih, both of them brothers, alongwith their family. “The water was seeping over the mud barrier they had erected and children were crying. There was only one lifebuoy, I handed it over to Yaqoob and we used a large iron tray to evacuate 7 women and 5 children”. Both men made three trips to rescue the whole family and even their herd of 15 goats. 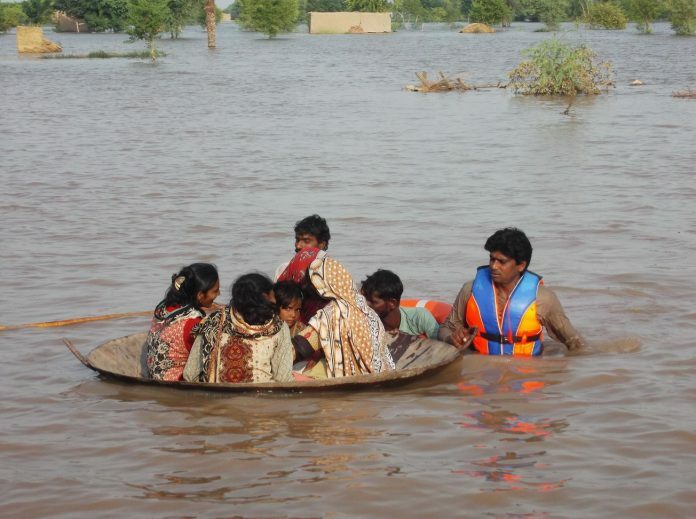 CPM teams rescued 550 families before and 100 families during this year’s disaster through its Disaster Management Committees in two Union Councils of Muzaffargarh district. CPM distributed food packages, hygiene kits and tents among 100 families on October 3 at Chak 205 and a medical camp is planned later this month. “All DMC members were in constant contact with District Control room through telephone kept sharing the updated information regarding the water levels. Together with Irrigation Department, the members also supervised embankments in Rangpur city”, said Mr. Samuel Clement. “We are proud to have a committed team and reach deep areas where no humanitarian organization had reached to support the affected families. Any kind of support can help in saving more lives”.